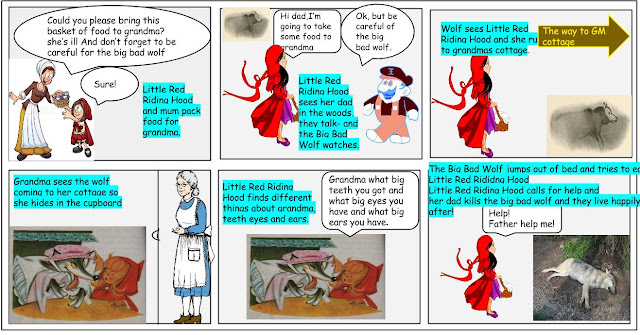 We have been learning about narrative writing and one of our activities to begin our unit was to create a comic strip about Little Red Riding Hood. We were learning distinguish different events in stories, summarise the main events and use speech. We had a lot of fun doing this. We also had to experiment with different tools in Google Draw. That is so cool that you made you own little red riding hod table. Little red ridding hod was my faviourte story when I was little well done. Kia ora Room 5. It's Mitchell from Room 6. I really like the Little Red Riding Hood storyboard because it's so adventurous. Your images match the story perfectly. You have done a great job. I look forward to seeing more of your posts. Well done Room 5. Perhaps a couple of you could come over and show my class how to do it!